An international research collaboration has developed a noninvasive multimodal nanoparticle-based imaging agent that can assess the receptor for advanced glycation end-products (RAGE). More accurate assessment of the receptor, which was recently identified as a key structure involved in diabetic complications, also could help with earlier cancer diagnosis or advanced targeted therapy. The overexpression and activation by RAGE with its ligands initiate a number of biochemical pathways leading to oxidative stress and inflammation known to contribute to the pathogenesis of several diabetes-related complications, neurodegenerative disorders, as well as numerous cancer types. 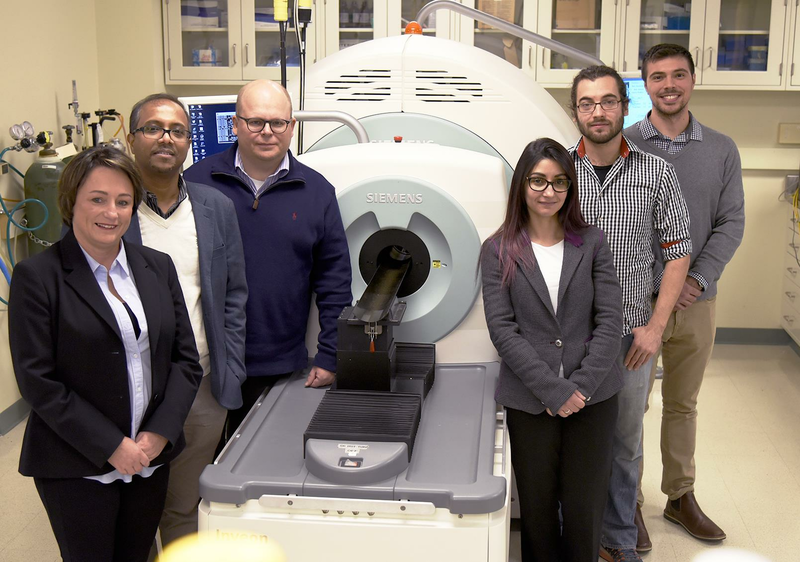 Members of the research team are pictured in the Molecular Imaging Lab at the Beckman Institute: from left, Iwona T. Dobrucka, Dipanjan Pan, Wawrzyniec Dobrucki, Jamila Hedhli, Aaron Schwartz-Duval, and Christian J. Konopka. The advanced glycation end-products (AGE) generated during the glycation process and their receptor represent a new biomarker of a disease process involving inflammatory pathways, said Dobrucki, who also is the head of the Experimental Molecular Imaging Laboratory at the Beckman Institute and a co-leader of the Multimodal Vascular Imaging Group. Dobrucki and the team observed how AGE activates the receptor (RAGE), causing an overexpression of that receptor. Details of this discovery appear in the paper, “Multimodal Imaging of the Receptor for Advanced Glycation End-products with Molecularly Targeted Nanoparticles,” which was published in Theranostics. An image featured on the inside front cover of the issue was created by Jose Vazquez, of Beckman’s Visualization Lab. A major focus of the four-year study was developing and characterizing the imaging tracer—synthesized in the lab—because there was no existing mechanism for imaging advanced glycation end-products and their receptor. The imaging allows for serial noninvasive tracking, as the injected radiotracer binds to the receptor, and then molecular changes over time can be assessed and quantified. And the group already has a method in mind that might link the activity of the radiotracer to the etiological state (the cause or origination). The next paper—that has already been submitted for publication—shows for the first time the imaging of prostate cancer using the same particle. “We are not interested in the early diagnosis of cancer, because other people are doing this," Dobrucki said. "We are interested in the moment when cancer becomes more aggressive, when it starts the transition from an indolent to an aggressive disease. According to Dobrucki, there is another important aspect of this work as it relates to the cardiovascular system and cancer—formation of AGEs not only result from diabetes, but people digest them in foods. The research also will seek to find out, for example, how diet effects the RAGE expression, which may be causing an increased incidence of cancer and atherosclerotic complications. Other Illinois researchers who contributed to the work are: Christian J. Konopka, Beckman graduate research assistant and PI for the paper; Jamila Hedhli, a Beckman–Brown Interdisciplinary Postdoctoral Fellow; Dipanjan Pan, an associate professor of bioengineering; and Iwona T. Dobrucka, senior research scientist and director of the Molecular Imaging Lab in Biomedical Imaging Center. In addition, Aaron Schwartz-Duval, graduate research assistant in bioengineering, Gnanasekar Munirathinam, U of I College of Medicine, Rockford; and several international collaborators from the Biobanking and Biomolecular Resources Research Infrastructure, Gdansk, Poland, and the Medical University of Gdansk, contributed to the research. This work was supported by the American Heart Association Scientist Development Grant and the Foundation for Polish Science.